Thel 'Vadam: "What is it? More Brutes?" 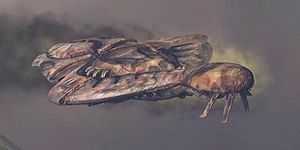 Indulgence of Conviction was a Covenant CCS-class battlecruiser that was captured and infected by the Flood parasite. The Flood used this vessel in an attempt to infect the human homeworld of Earth. "Find the crashed Flood ship; overload its engine core. We either destroy this city, or risk losing the entire planet." During its service with the Covenant, the offensive and defensive abilities of Indulgence of Conviction, combined with the cruiser's large personnel and equipment capacity, made it ideal for troop and vehicle deployment during ground engagements, as well as ship-to-ship naval combat. Indulgence of Conviction was later captured by the Flood during the Sangheili's quarantine of Installation 05 and High Charity. After absorbing the ship's crew and passengers to provide biomass, the Flood broke through the Sangheili blockade and set course for Earth. The ship arrived at Earth moments after the Prophet of Truth's forces activated the Forerunner portal device between Voi and Mombasa, Kenya. The ship crash-landed just outside the town of Voi, releasing numerous Flood forms into the city. These forms immediately began to infect the UNSC Marine defenders and the corpses of Covenant forces killed during the previous battle. Its infected crew and the newly-infected victims quickly spread, threatening to overrun the city of Voi and its surroundings. In order to prevent further Flood contamination, Spartan-II John-117 and Arbiter Thel 'Vadam decided to destroy the ship by detonating its fusion reactors. However, the Sangheili Fleet of Retribution, led by Shipmaster Rtas 'Vadum, soon emerged from Slipspace over Voi. 'Vadum ordered the humans to evacuate the area, while he dealt with the Flood. At the same time, John-117 learned that Cortana might be aboard the ship. Hoping to rescue her, the Chief, Thel 'Vadam, and a newly arrived squad of Special Operations Sangheili pushed forward and reached the crash site. While Thel and the Sangheili stood guard outside, the Chief entered the crashed ship through a breach in its hull. Inside, he found a device that later turned out to contain an important message from Cortana. Soon afterwards, the UNSC and Sangheili ground forces evacuated the area, while the Fleet of Retribution began to glass the contaminated area and square kilometers around it, destroying the remains of the ship and halting the Flood threat. The Flood-infected scout ship was originally going to be the assault carrier Shadow of Intent. The scout ship was later replaced during development by an unnamed CCS-class battlecruiser, as the Shadow of Intent became Rtas 'Vadum's flagship. The cruiser's name Indulgence of Conviction was eventually revealed years later through the Halo Starscope, a promotional website for Halo: The Master Chief Collection. Around 75% of the interior of the ship in the level Floodgate was cut. As almost the entirety of the level Cortana was also deleted, most of the cruiser's interior was recycled into High Charity. The cruiser's own geometry was also used for High Charity as the holy city's own geometry was cut. The battlecruiser is the first setting in the Halo universe for which Bungie created a Flood architecture from scratch thus defining the faction's visual language, including the biomass, organic terrain and tunnels, crusty excretions, growth pods, pustules, portas, fungus and coral reef-like elements. The design mainly emanated from Vic DeLeon, Frank Capezutto and Isaac Hannaford. A number of Sangheili bodies are encountered on the ship, which may indicate it was under Sangheili control at the time of the Schism. Concept art of the ship as an assault carrier. Concept art of the crash. Another concept art of the crash. The ship arriving on Earth. The crash site of the battlecruiser. Flood growth pods within the crashed battlecruiser.